The new IPCC report claims reducing CO2 emissions will help to provide food security for the future, but the opposite is true. Hundreds of scientific papers prove increased CO2 fertilization markedly increases photosynthetic rates and biomass production of all the world's major crops, in addition to increasing resistance to drought. And there is also the significant body of work that reveals that as the atmosphere's CO2 concentration rises, the various temperatures at which different plants photosynthesize most proficiently rise right along with it. IPCC decarbonization policies will decrease agricultural production, and lead to more malnourishment and poverty due to higher energy and food prices. Reference: Muldowney, J., Mounsey, J. and Kinsella, L. 2013. Agriculture in the climate change negotiations; ensuring that food production is not threatened. Animal 7:s2: 206-211. Muldowney et al. (2013) introduce their analysis by writing that "with the human population predicted to reach nine billion by 2050, demand for food is predicted to more than double over this time period." And they go on to say that "in the establishment of the United Nations Framework Convention on Climate Change (UNFCCC), 'ensuring that food production is not threatened' is explicitly mentioned in the objective of the Convention." Nevertheless, as they continue, they note that "until recent years" this need for a doubling of agricultural output "has had a relatively low profile within the UNFCCC negotiations." And they note that even the IPCC has recognized "it is necessary to increase agricultural production." Yet the primary efforts of both of these entities have been, and continue to be, directed against that which is most needed to produce the required amount food, as they both argue for reductions in anthropogenic CO2 emissions, which comprise much of the aerial "food" that sustains all of our food crops. As evidence for this latter contention, the Center for the Study of Carbon Dioxide and Global Change provides a listing of the experimental findings of a vast collection of scientific papers that support this point of view of the subject in their Plant Growth Database. There, it can be seen that enriching the air with CO2 almost always leads to significant increases in the photosynthetic rates and biomass production of all of the world's major food crops. And as for the highly-unlikely increase in global temperature that the world's climate alarmists predict to result from projected increases in the air's CO2 content, there are also many studies that reveal the positive consequences of warming for agriculture in Earth's cooler high-latitude regions, such as the recent study of Meng et al. (2014) dealing with maize production in the northern reaches of China. And there is also the significant body of work that reveals that as the atmosphere's CO2 concentration rises, the various temperatures at which different plants photosynthesize most proficiently rise right along with it (see for example,The Spector of Species Extinction: Will Global Warming Decimate Earth's Biosphere?. All things considered, therefore - including the many journal reviews on this website that recount the many failures of the most sophisticated climate models yet developed to replicate real-world past climatic histories in almost all parts of the planet (see Climate Models and their Limitations in the Topical Archive) - perhaps one of the more prudent actions to take to assure the production of sufficient food to feed our descendants (as well as many of us) a mere three and a half decades from now would be to stop trying to reduce anthropogenic CO2 emissions. Meng, Q., Hou, P., Lobell, D.B., Wang, H., Cui, Z., Zhang, F. and Chen, X. 2014. 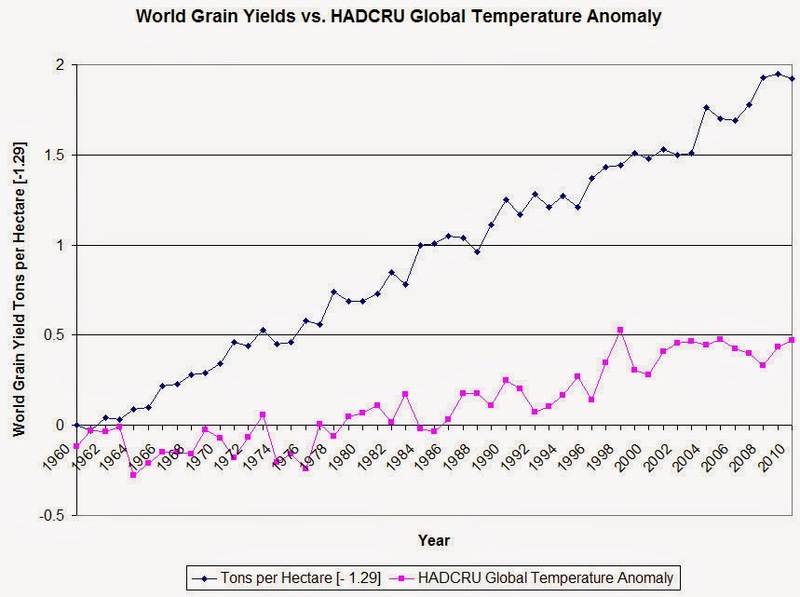 The benefits of recent warming for maize production in high latitude China. Climatic Change 122: 341-349.